Public schools opened classes for the School Year 2018-2019 in June, and all of the 140 scholars of the Insular Foundation’s Adopt-A-Scholar Program in Itaas Elementary School successfully advanced to the Grade 2 level with zero drop-outs. 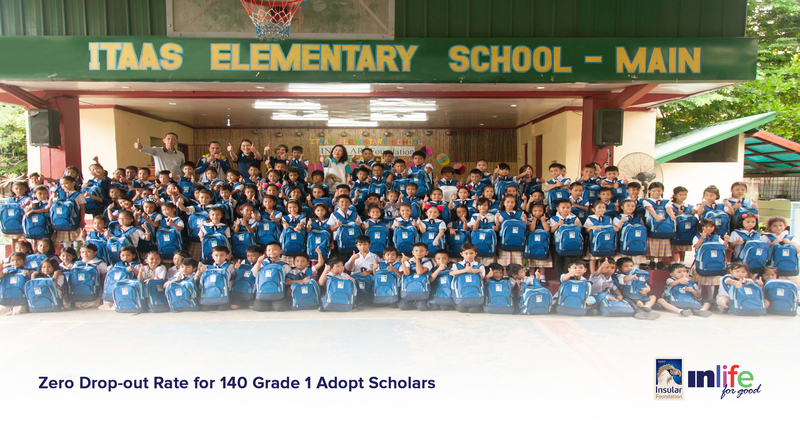 Adopt-A-Scholar Program, now in its fifteenth year and third phase, has seventy-two Insular Life employees sponsoring one or more scholars, for six years. The program’s objective is to contribute to the completion rate in primary education, specifically at the elementary level through the educational assistance in the form of back-to-school kits. Ms. Ana Maria Soriano, the Insular Foundation Administrator in her message, during the recent turn-over of the back-to-school kits, stressed the critical role of the parents in creating excellent and disciplined study habits of their children. She said further that the Adopt Sponsors only require one thing from the parents, which is to keep their children in school. “The zero-drop out rate for the first year of our educational assistance is good news to us because it means that the program accomplishes its purpose. But, a lot of work still needs to be done regarding finding ways to keep our Adopt scholar in school for the coming years. Aside from the cash incentives for the top three Adopt scholars that we award every year, Insular Foundation is looking at opportunities for proactive parent-involvement in the learning process.” Ms. Soriano added. Mrs. Fritzel Mallari, a parent of one of the scholars in her message of response, said they are very grateful for the educational assistance from the Insular Foundation and promised that they would do all their best to make the Adopt Sponsors proud of their scholars. Adopt-A-Scholar Program is a program of Insular Foundation that allows employees to adopt a child from Grade 1 up to Grade 6 by providing children with educational materials at the start of the school year. Since the program started in Muntinlupa Itaas Elementary School in 2001, 242 scholars have already benefitted from the educational assistance given by more than 100 Insular Life employees. Photo 1: Thumbs-up group photo of the Itaas Elementary School Turn-over with the Grade 2 pupils, Insular Foundation representatives and Itaas Elementary School officials. Photo 2: Itaas Elementary School Principal, Mr. Raul T. Felix, IES Adopt A Scholar Coordinator Mrs. Vicky Kondo, and Insular Foundation Administrator, Ms. Ana Maria R. Soriano together with the top three Adopt scholars holding their cash incentives envelopes for their outstanding academic performance during the School 2017-2018.